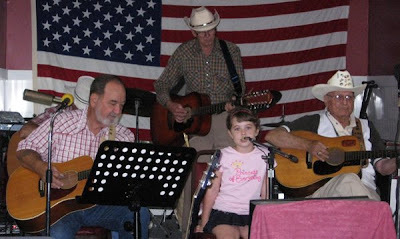 Located around six miles past the Alabama State Line in Mississippi, the Columbus Opry is owned by country musician Benny Davis (in the red shirt on the right). Every Saturday night beginning at 7:00 he is joined by over a dozen fellow musicians and singers who perform for an audience of music lovers of all ages. The opry is family friendly and house rules forbid drinking, smoking and cussing. Benny welcomes musicians and singers who turn up for the show to join in. 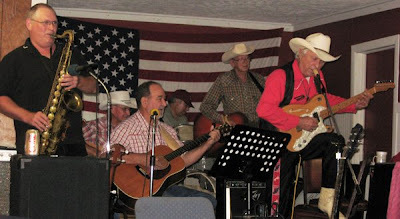 Regular Musicians (singers are marked with *) are: Violin: Jim Fain*; Finger guitarist: Gene Reed*; Rhythm guitar: Ron Bailey*;Lead guitar, fiddle, banjo, harmonica: Benny Davis*; Rhythm guitar: Hap Hammond; Bass: Linda Garrard*; Guitarist: James Cumberland*; Guitarist: Leon Winters; Drummer: John Hammond,Jr. * Singers not on-stage include: Carolyn Reed, Denzel Aldridge, Ruby Bell, Dale Cumberland, Hilton Hammond, Ruth from Aberdeen has joined lately (sings gospel), Doyle Spears picks and sings when he is there. Benny recently purchased the opry building and is working on making improvements to the building and grounds. Central air conditioning has already been installed and an electric sign awaits a tall concrete pole required by the city. The Columbus Opry is a labor of love rather than a money making venture. Funds are short and donations are welcomed. All money collected goes towards paying for the property and utilities. How to get there: From the East take Highway 82 to the first exit in Columbus (Hw 12/50). From the west, Hw 12/50 is the last Columbus Exit. Go right on highway 50 for approx. 1 mile. You'll come to a 3-way Stop (2 gas stations at the intersection ) and turn left onto Gardner Blvd. Go approximately 1/4 of a mile. There will be two 40 mile/hr signs, after the second 40 mile/hr sign the Columbus Opry is on the first alley on the right which is a dirt/gravel road. The alley is in between Jerry's Upholstery and a Pawn Shop. The opry is a small white building on the right. The video clip is of "I Don't Know What She Said" with Lars Espensen playing saxophone.